Install OpenOffice 3, or use the Portable (Suite Standard) version. 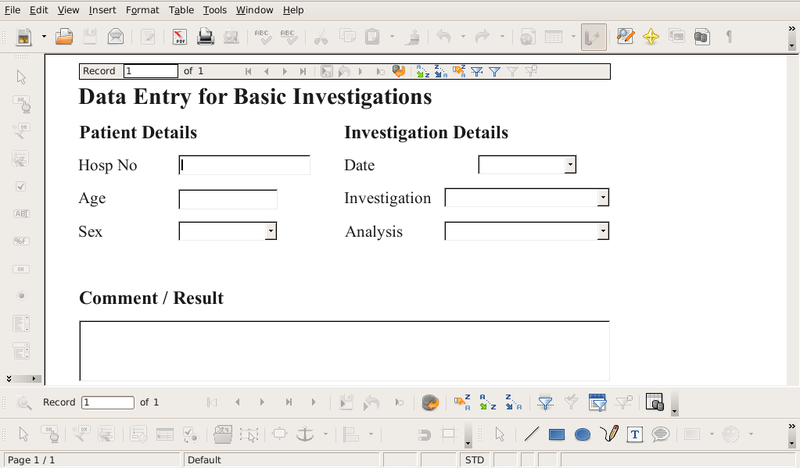 Open file LogbookV1.0.odb in OpenOffice Base. 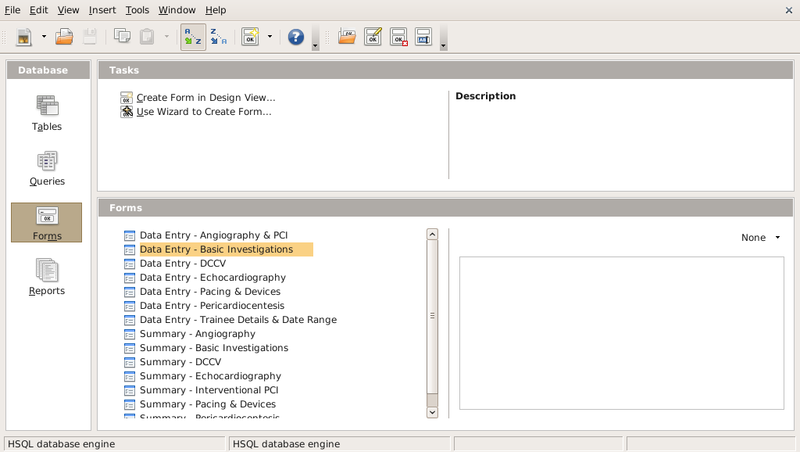 Double-click on the relevant Data Entry Form (Basic Investigations highlighted in screenshot above). Type in data into 3D effect boxes using mouse or Tab key to move between boxes. Data will be saved automatically if you create a new Record, or use the Save button (disk icon) at the top of the record. Just as with adding data, but use the relevant Summary Form. Note, you cannot export to PDF correctly, since it appears to export without the relevant data included; a workaround is to print to .ps (PostScript) file and then use a PS to PDF converter. Use the Data Entry – Trainee Details and Date Range Form, and enter details as in 5 above. Remember, this affects the Summary printed in 6 above. There should be no need to use the Tables, Queries or Reports functions, except when upgrading the logbook to a new version, when all the Tables will need to be manually copied from the old logbook to the new version. Questions? Ask here as a comment. Glad it is behaving as expected! When I get around to adding the EP and MPI logbooks, I will try and add a tutorial on copying tables to the new version. Let me know if anything doesn’t work properly – it should be OK, since I’ve been debugging it for a few months, and my RITA paperwork was as it should be. great logbook. do you know a way to synch with the iphone? Unfortunately, Openoffice is not being ported to any mobile platform (Windows Mobile, iPhone, Blackberry etc), so this is a current limitation. If anyone does find a way to sync with their PDA / phone, I would definitely be interested to know how. There is no reason to reset ID – it merely acts as a unique identifier. If you insist on doing so, you will have to remove the autonumber feature for primary ID, enter the number 1, re-instate the autonumbering, and it should then work. I’d recommend you leave it alone unless you already know how to use OpenOffice. Looks like I’m late to the party here but…I ran across you here:https://forum.openoffice.org/en/forum/viewtopic.php?f=39&t=6199 while looking for information on using Base. Your logbook project looks like exactly the kind of thing I’m trying to accomplish: moving my personal financial database from MS Access to Base. I’ve only recently discovered that Base appears to now be a viable alternative to Access, as well as free and open source. I would love to get a copy of your DB; if you could email me a link or post to my Google+ profile I would be most grateful. FYI in my G+ profile you’ll also find a link to my blog about how I was trying to do a similar thing with Python. Cheers! I’ve updated the download link to copy.com @ https://copy.com/eyGzockvAZ4J since SugarSync is no longer free. Good luck with your project. For any cardiology trainees, I’m still using and updating the logbook for personal use.